At the start of the season, Nathan Sobey thought he had a slow year ahead of him. Having recently returned to the racing scene, the young horseman planned to pick up more catch drives, work on a few horses, and perhaps learn a thing or two that would give him an edge on a racetrack that’s thriving with competition. Then, a few weeks ago, he found himself in the midst of a move that saw his stable swell from holding three horses to ten. That’s good news—especially since Sobey will have his hands full as he officially takes over training duties for the storied Don Byrne Stables. The stable formed in 1994, when husband and wife Don and Francoise Byrne decided to venture into owning and racing Standardbred horses. 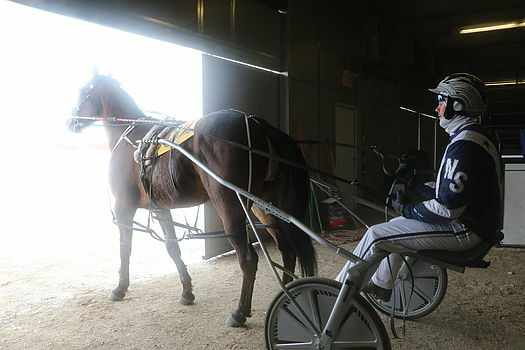 They found a key third piece in a partnership with horseman Don Monkman Jr.—who would go on to hit the 2,500-win milestone in 2006—and gained recognition by bringing up headline-grabbing horses. Among them were Stiletto Hall, whose lifetime winnings pushed past $400,000, Western Hanover son Keystone Matt, and 50-time winner Balanchine. In time, the Don Byrne Stables also built a reputation for its work in breeding. According to the Don Byrne Stables’ website, the barns have seven two-year-olds in training, four horses who are currently racing, and retired horses Rocket Moma and Outlawsurshotshark, who will be bred this year. Luckily, Sobey doesn’t need much time to get up to speed on his new equine buddies. He knows a few of the horses through his previous work, and also picked up a bit of knowledge from Campbell. “It’s not so much getting used to them and getting everything figured out, so much as trucking forward and getting ready to race,” he said. Part of that work was done earlier that morning. Sobey qualified Pickles On Top on Saturday, April 15. The fillly breezed to a first-place finish in 2:02.3. Easy pickings, for a horse who came second place in last year’s Alberta Sires Stakes (ABBS) Super Finals. Still, it’ll be a while before she sees any racing action. The horseman plans to qualify her again next week, then give her one week’s rest before the start of the stakes races season. For top-tier talent, stakes races are where horses can earn paychecks ranging from $15,000 to as much as $80,000 in the ABSS Super Finals. Of course, doing so requires a stroke of endurance and a little luck with avoiding injury and illness. Sobey doesn’t plan to take any risks. For all of her size and strength, the horseman admitted that she’s far from the soundest horse and needs a lot of maintenance to keep competing at a top level. But when she does stay sound, she shows the characteristics that make her such a special horse. The horseman also praised her versatility and her ability to be able to push for a win regardless of whether she’s trailing behind, sitting in the middle of the pack, or leading out front. “I really think this mare can do it from anywhere. I’ve seen her train, I’ve seen her race. I really think she’s handy and can do it from just about anywhere,” said Sobey. Racing resumes at Century Downs on Sunday, April 23.